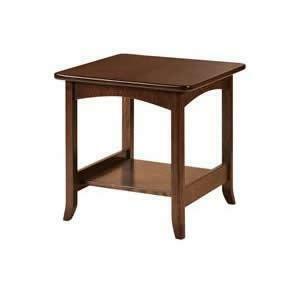 Our Santa Barbara End Table features a clean design that will pair well with a variety of styles. This mission-style solid wood end table includes a 1-inch thick top with rounded edges, arching aprons, an open shelf, and splayed legs with outside roundover. Shown in quarter sawn white oak with FC 230 onyx stain. Hi Folks, thank you very much for delivery of the furniture. John, you and your helper did a great job. I appreciate how careful you were and the expert way you put everything together. Let everyone know that the desk is gorgeous!! Such a beautiful piece of furniture. The end tables look fantastic. The coffee table has a small flaw (dent) on one edge, but I can over look that. It looks like a manufacture oversight, not result of the shipping. Overall I am very pleased with the whole process from order to delivery. I will highly recommend your company/John to anyone who asks.